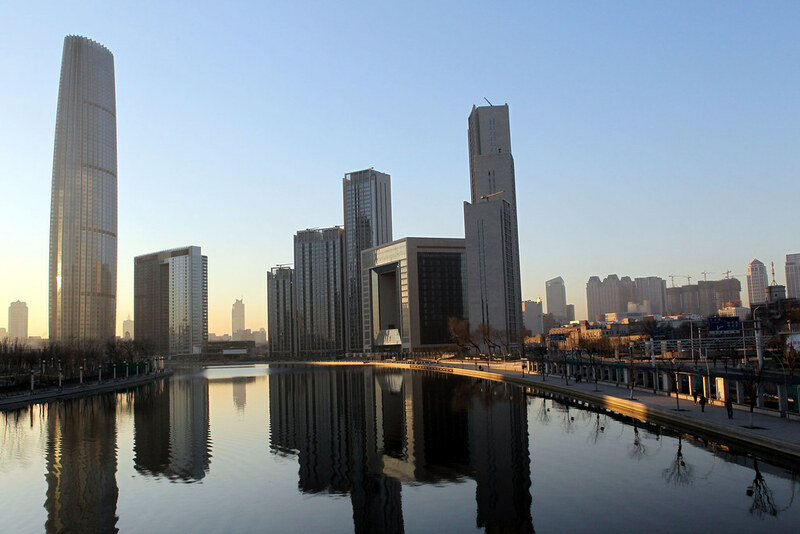 Where does Chinese development finance go? 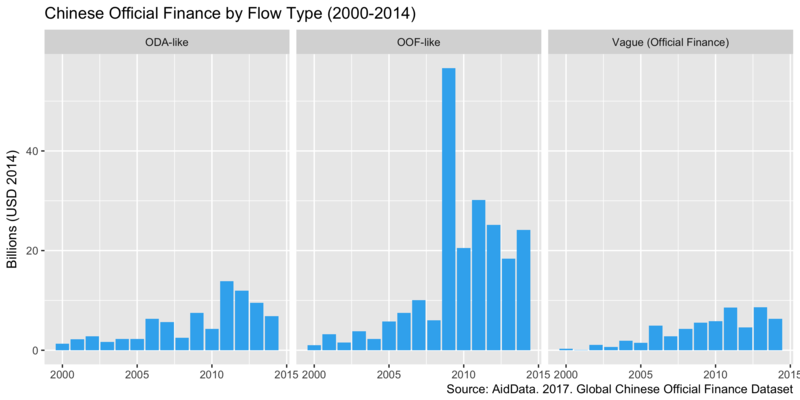 This post looks at the recently updated “Global Chinese Official Finance Dataset” from research group AidData. The post is also available here as an R Notebook which means you see the code behind the charts and analysis. China has provided foreign assistance to countries around the world since the 1950s. Since it’s not part of the DAC group of donors who report their activities in a standard manner, there isn’t an official dataset which breaks down where Chinese foreign assistance goes, and what it’s used for. A team of researchers at AidData, in the College of William and Mary have just updated their “Chinese Global Official Finance” dataset. This is an unofficial compilation of over 4,000 Chinese-financed projects in 138 countries, from 2000 to 2014, based on a triangulation of public data from government systems, public records and media reports. The team have coded these projects with over 50 variables which help to group and characterize them. This dataset is interesting for two reasons. First, China and other emerging donors are making an impact on the development finance landscape. As the Bank has reported in the past (see International Debt Statistics 2016), bilateral creditors are a more important source of finance than they were just five years ago. And the majority of these increases are coming from emerging donors with China playing a prominent role. Second, this dataset’s activity-level data gives us a look at trends and allocations in Chinese bilateral finance which can inform further analysis and research. Organizations like the World Bank collect data on financial flows directly from government sources for our operational purposes, but we’re unable to make these detailed data publicly available. We compile these data into aggregate financial flow statistics presented from the “debtor perspective”, but they’re not disaggregated by individual counterparties or at an activity-level. So there can be value added from sources such as AidData’s China dataset. However, this dataset has limitations. It only presents estimates of “official bilateral credits”. These are flows between two governments, and are just one part of the total financial flows coming from China. By contrast, the World Bank is able to integrate the granular data it collects from countries into the full set of financial flows to and from its borrowing countries. This situates official bilateral credit among the broader spectrum of providers of long-term financing (such as bondholders, financial intermediaries, and other private sector entities), sources of short-term debt (including movements in bank deposits), and equity investments (foreign direct and portfolio investments). This data integration leads to better quality statistics. In short, AidData’s China dataset provides more detail on one type of financial flow, but is likely to be less reliable for a number of low-income countries. With these caveats in mind, I’ve done a quick exploration of the dataset to produce some summary statistics and give you an idea of what’s inside. Official Development Assistance (ODA), which contains a grant element of 25% or more and is primarily intended for development. Other Official Flows (OOF), where the grant element is under 25% and the the financing more commercial in nature. Vague Official Finance, where there isn’t enough information to assign it to either category. It looks like more Chinese finance is classed as OOF ($216bn in the period above) than ODA ($81bn), and that 2009 is a bit of an outlier. With this dataset, we next can figure out which countries are the top recipients of ODA and OOF, and also which sectors are most financed. Every minute, dozens of people in East Asia move from the countryside to the city. The massive population shift is creating some of the world’s biggest mega-cities including Tokyo, Shanghai, Jakarta, Seoul and Manila, as well as hundreds of medium and smaller urban areas. This transformation touches on every aspect of life and livelihoods, from access to clean water to high-speed trains that transport millions of people in and out of cities during rush hour each weekday. Dong Yang is a first-year Ph.D. student at the University of Chinese Academy of Sciences. He majors in public administration. Dong got in touch with us to share his experience using World Bank Data as part of his research. William Shakespeare once wrote, “There are a thousand Hamlets in a thousand people’s eyes.” Similarly, different people have different understandings of database services. Some people believe it is a type of personalized service, some believe it’s a value-added service, while others believe it’s a solutions-driven service. For us students, database services are vital to our research. As a form of knowledge service, databases should be adapted to the changing needs of users, supporting both knowledge consumption and knowledge creation. A good database helps not only to convert “data” into “outcomes,” but also achieve the goal of pooling wisdom and creating knowledge by enhancing a user’s creativity with its rich resources and services. In my view, the World Bank’s Open Data has truly fulfilled these functions.